Water garden pond plants should blend in with your landscape as well as the design of your water feature. They should be visually appealing while contributing to the overall health of your pond and aquatic wildlife. If your water feature is a formal design (geometric shapes and clean lines), limit choices to a few, carefully chosen, plants. Pond plants in a variety of shapes, colors, and textures are the best choice for informal water garden designs. Plants surrounding your water garden pond should be practical and functional, as well as pleasing to the eye. Plants around a water feature can be used to reduce wind, define a pathway, frame a view, and discourage predators. Water Garden Pond Plants – What Are Your Choices? Submerged Plants (also known as oxygenators) grow below the water surface. They keep the water biologically and chemically balanced by filtering and oxygenating the water naturally. Submerged plants also prevent algae build-up. Floating Plants float completely on the surface of the water, or the roots are planted in potted soil underwater with the leaves and flowers floating on the water surface. They prevent algae build-up while keeping the pond water cool and shady. Water lilies and lotus are popular floating plant choices. Marginal Plants grow in shallow water. They are planted in soil underwater, with their leaves and flowers growing above the water surface. Marginal plants provide shade and help to naturally filter the water. They are ideal for informal water garden designs when used to conceal the edge of a preformed liner or rigid shell. Bog Plants grow in wet, soggy soil. Roots are not entirely submerged. They can be planted in pots and placed on low shelves in the water garden pond. When planted next to an informal water garden design, bog plants create a smooth transition within the landscape. The best plants for you water garden will depend on a variety of factors. Location – Keep in mind the climate you live in when selecting water plants. Also, the location of the water garden in your landscape is important to keep in mind. How much sun will plants receive daily? How much shade? Is the water garden exposed to wind? Know the answer to these questions to make the best choice the first time around. Pond and Landscape Design – Select plants that accent the design of your pond and landscape design. Large, leafy plants blend in with an informal design. Formal ponds require fewer plants with clean lines (can be achieved by pruning). Maintenance and Care – Will you be caring for you water garden, or will you hire a gardener? Consider how much time and money you are willing to invest. Biological Benefits – Select plants with the biological benefits in mind. 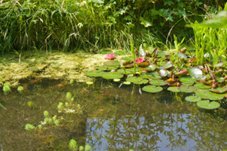 The best water plants filter impurities, reduce algae build-up, and promote the health of fish and other wildlife living in your pond. Since most plants do not bloom year-long, choose plants with foliage in a variety of shapes, sizes, colors, and textures. Some plants will not thrive as expected, while others might die. Be willing to try different varieties.